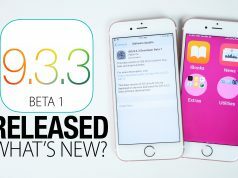 Today, Apple seeds iOS 9.3 beta 7 (13E5233a / 13E5234a) to developers, this new seed comes one week after the sixth beta seed, and just one week before the 21st March event. iOS 9.3 beta 7 may be the final beta release, as a public release is expected mid-March. 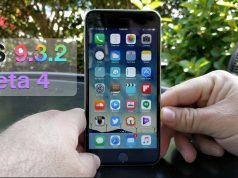 While the beta 7 does not bring any significant changes to the upcoming iOS release it features under the hood improvements for new features that are introduced in iOS 9.3. The major features include Night Shift to help with sleep issues and multi-user login for education accounts. Touch ID protection for Notes app, new 3D Touch actions, new features for CarPlay and more. Apple Watch: Using iOS 9.3 and watchOS 2.2, Apple now allows an iPhone to pair with more than one Apple Watch. Both devices require the latest beta updates. with Watches running watchOS 2.2 and an iPhone running iOS 9.3. Night Shift: Reduces blue light at night, much like f.lux does on a Mac. In beta two, a toggle button for iOS 9.3’s new Night Shift feature was added in the Control Center on the iPad and iPhone. A later beta included a tweaked Night Shift toggle switch in Control Center, removing the confusing pop-up message from the icon. 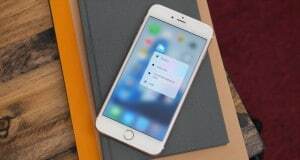 Notes: The app is now password protected and Touch ID compatible, and includes new features for sorting by date created, date modified, or alphabetically. Apple News: Improved News algorithms offer more tailored articles in the “For You” section. It also includes a new landscape mode and in-line video playback. Health: A new interface makes it easier to see move, exercise, and stand data. A new menu in certain categories helps users to discover apps that can be used to track health data. CarPlay: CarPlay includes “New” and “For You” sections in Apple Music, and a “Nearby” feature in Maps helps users discover the best local restaurants, coffee shops, and more. Education: Shared iPads for students, a new Classroom app, and an AppleSchool Manager. Wi-Fi Assist: iOS 9.3 offers a counter informing users with Wi-Fi Assist installed how much cellular data they’ve used. Verizon Wi-Fi Calling: Added in the third beta of iOS 9.3. 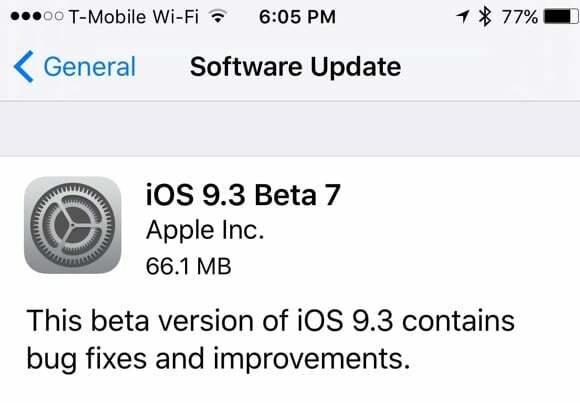 This will likely be the final beta of iOS 9.3, which will likely see a spring release alongside OS X 10.11.4, tvOS 9.2, and watchOS 2.2, sometime following the March 21 Apple media event. The update is available in both Apple’s dev center and public testing portal, as well as via an over-the-air update for folks running the previous beta. If you are not a registered developer, then you will find direct download links and OTA profiles for iOS 9.3 beta 7 (13E5233a / 13E5234a) below. Before you begin, we recommend that you make a backup of your iDevice (iTunes and / or iCloud). You must install the profile on your iOS device, and once this is done, your iPhone and iPad will probably ask you to restart.